So.. 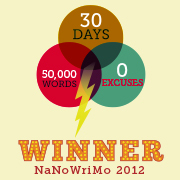 I won NaNoWriMo again this year. I finished three days early – with 50,058 words written this year added to what I wrote last year. Now I need to write the actual final chapters and not just scenes from the climactic ending, but hey – I’m a lot closer to a complete work than last year. Now it’s not a question of if I will ever self-publish, but when. Last year at this time, I was reading over my novel, and I was really frustrated, because it seemed complete unrealistic. At about the half-way point of the story, I had one of my two main characters do something completely out of character for the way I had written about her up to that point. I did it because I couldn’t think of any other way to get her in the excruciating position she needed to be in so the villain could torment her and drive the rest of the plot. But that false note made all the rest of it seem really hard to believe. It just didn’t read right, and all the following events seemed flat and desperate, like a huge rationalization. I chewed on that for the whole rest of the year and didn’t know what to do. I loved the beginning and loved the characters, but I hated the middle and the end. This year Garrett Hutson said something at the being of November about plot development along the lines of – “know where your characters are going to go, but to get them there, use a compass, not a map.” That set me thinking – okay, if that plot point seems out of character for my main character, what would she actually do instead? I threw out everything except the end where the characters needed to go, and started writing from just before that false note… and I realized if I changed the villain slightly, and added secondary villain who was working with and also at cross-purposes to the first one, I could get the MC into that excruciating position in a more real way, and then all the dominos started to fall one by one. Now I like the whole story from beginning to end. Even though I threw out 23,000 words I wrote last year and started over, this is a much better story, and one that makes me really happy to read throughout. I’m in danger, though, of not keeping up with the story now. I hate that the 50,000 word mark was a finish line of sorts, because it’s not done at all, and I still need to keep writing it. It’s good, I think, and original, and interesting, so I need to actually push through and finish. It was a huge accomplishment that I never thought I could do once, let alone twice. I need to make it work for real. If you could – cattle prod me, please? Bug me about it as much as possible so I don’t get complacent. This was cool, and something that was important to me to do, so I don’t want to let it slide.